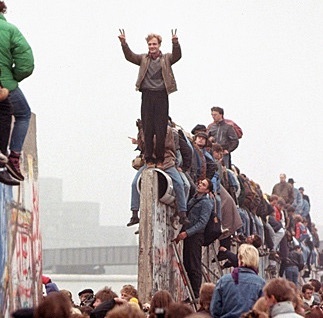 Today everyone is marking the 25th anniversary of the fall of the Berlin Wall—the signal event of the end of the Cold War. I find that students today, all born after the demise of the Soviet Union, have a hard time grasping the depth and vividness of the conflict. The Cold War might as well be the Boer War, and the Berlin Wall is as hazy as Hadrian’s Wall. It is amusing to watch the liberal establishment observe this glorious anniversary with a binge of subtle revisionism that adds up to: Reagan had nothing to do with it. Pay no attention to that 1987 speech at the Berlin Wall (the one these self-same fashionable people all ridiculed at the time). It was . . . anything but that! We Americans like to think that the dismantling of the Wall confirmed the redemptive role of United States, the correctness of containment, the efficacy of the arms buildup initiated by President Ronald Reagan, and the universal appeal of freedom. The Wall’s fall reified Americans’ exceptionalist view of themselves. . .
With what we now know about the history of the Wall coming down — the contingency of the event and the agency of ordinary people — we should draw different lessons, ones that are not about the universal appeal of freedom or the munificence of free markets or the efficacy of strength, power, and containment. All that “peace through strength” stuff, the “evil empire”speech, and the rest? Nah. It was . . . NGOs. Seriously? We need, first, to acknowledge the role of the human rights revolution and the agency of non-governmental organizations (NGOs), like Helsinki Watch, the Workers Defense Committee (KOR) in Poland, and Charter 77 in Czechoslovakia, and many others. These groups, though diverse in ideology and tactics, all clamored for change, openness, free expression, individual opportunity, religious liberty, and human dignity. Historians are now coming to appreciate the energy and agency of these NGOs in the fall of communism. Keep spinning liberals. It’s fun watching you guys get dizzy and fall over.